Schwartz & Wade, 9780385378437, 40pp. The fastest man in the West meets his match in this deliciously clever original tall tale. With his extra-long legs, Jackrabbit McCabe can outrun anything on the American frontier: horses, trains, and even twisters. So of course, everyone in the town of Windy Flats always counts on his speed when a message has to get out fast. Then something new comes to town: the telegraph, which can send Morse code messages with the speed of electricity. At first, no one believes the newfangled contraption can deliver a message quicker than Jackrabbit. . . . But in a race between man and machine, who will be left in the dust? An author's note includes information about the invention of the telegraph, a Morse code key, and a riddle written in Morse code for kids to transcribe. 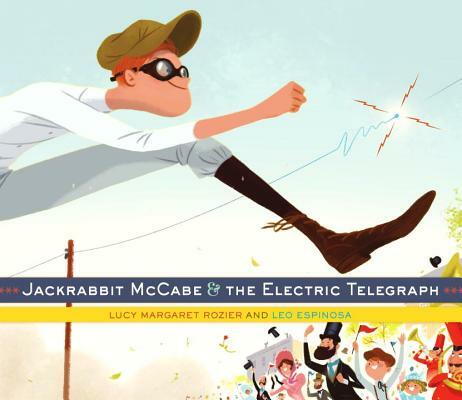 Lucy Margaret Rozier makes her picture-book debut with Jackrabbit McCabe and the Electric Telegraph. She grew up folk dancing and drawing in North Carolina and worked for many years as a fine artist and a commercial artist in the Boston area. She has two grown daughters and lives in her native North Carolina with her husband and their dog, Rosie. Leo Espinosa’s illustrations have graced the pages of the New Yorker, Wired, Esquire, and the New York Times, among many other publications. He is also a commercial artist whose work can be seen on toys, games, stationery, and clothing. Originally from Bogotá, Colombia, he lives with his family in Salt Lake City. Learn more at studioespinosa.com.